FEATHER: LONG Sleeves, Hooded, Pull Over Style. A UNIQUE STYLE WOMAN OUTFIT. Colour : smokey blue. Size: UK S/M Size 8 - 10. Length: 22". Size: 12 14 UK Approx. Pit to cuff: 16". Distressed Chenille Jumper, no brand but new without tags. Lovely grey colour with jewel/bead detail on neck and distressed look. Great item looking for a new home! Please see my other listings for more items, happy to combine postage - 1st and 2nd class delivery options available. Black Sequin Detail. Long Sleeve. From QED London range. Soft black & red striped chunky knit cozy jumper. Long sleeved. Great used condition, makes any outfit look effortlessly cool and chic. Fabric composition: 50% Viscose 28% Polyester 22% Nylon. Colour: Black. UK 14 approx Label size 'L'. Size: OSFA 16 18 20 UK approx. A quality 80s dark red mohair cardigan. Bust: 46" (23" pit to pit). Length: 28". Collar to cuff: 28". 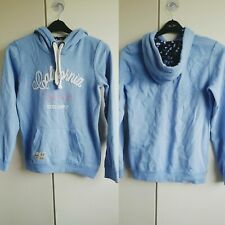 This colourful and funky H and M jumper has only been work a handful of times and is still in good condition. It has bright patterns that are printed onto the knitted fabric. it has a feature of being cropped and the front and slightly scoops lower at the back (as you can see in the photographs) Will definitely keep you warm in the winter! Lovely Fleece Jacket Made by Damart True Vintage 1980s Two lower front slit pockets Made by Damart Front buttons fastening Collar Warm and suitable for autumn Dark blue Oversized Fully lined in polyester material (One size) UK 18 EU 48 US 14 Pit to pit 25 in Length from shoulder to hem 30 in Underarm sleeves length 18 in Shoulder to shoulder width 19 ib Used in excellent condition. Please see my other items. Any questions please feel free to contact me. Thank you for looking! A quality mohair and eyelash style boho cardigan by Fluff 'N' Stuff of Colchester, Essex. Bust: 40" (20" pit to pit). Steam Punk Style Look 🍒. Machine Wash~See Care Label. Shoulder to hem~22"ins. 100% Acrylic. I add lovely dresses & clothing weekly. Waist~42"ins. Underarm to underarm~44"ins. This is a lovely Phase Eight Black silky frilly Gothic, Victorian style shrug, Bolero UK size 12 by Patsy Seddon with mother of pearl style buttons. EC Star Red Cardigan Ladies M Red Swallows Tattoo Rockabilly Punk Pin Up Hotrod. Beautiful red pin up style cardigan with black tattoo style swallows embroidered on the chest. This item has been worn so is a tiny bit fluffier and has a tiny bit more bobbling than when I first bought it but it's still in brilliant condition. No tears or fading. Ladies size 12. It's a fitted style. I'm having a huge clearout so please check out my other items! Thank you! I'm always happy to help or give further information. Acrylic 39% Polyester 32% Mohair 18% Wool 11%. Red and Black striped. Deep Rib Knit Neckline, Cuffs and Hemline. UKM 10 - 12 / EUR 38 - 40/ US 6 - 8. Armpit to cuff - 19". Very stylish & warm punk look! Colour: Black. Size: UK 8. Buttons Front, Chunky Knitted. A UNIQUE STYLE WOMAN OUTFIT. FEATHER: LONG Sleeves, High Neck. Size: UK Size 10.